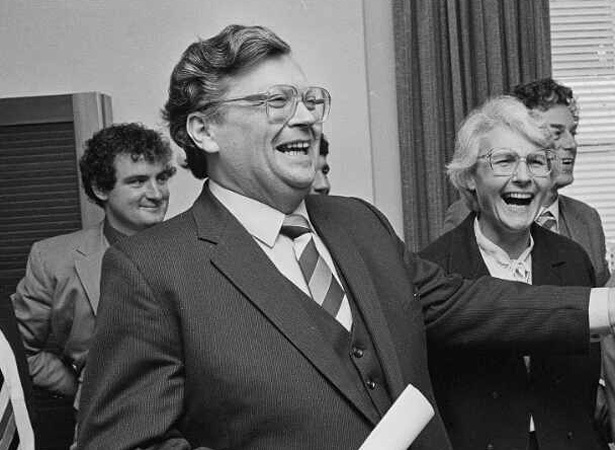 David Lange was New Zealand’s youngest prime minister of the 20th century. Renowned for his sharp wit and oratory, he led the fourth Labour government from 1984 to 1989. This was a turbulent era, characterised by New Zealand’s strong anti-nuclear position, the implementation of ‘Rogernomics’ and other radical changes. Lange suffered poor health for many years, including diabetes and heart problems. In 2002 he was diagnosed with a rare and incurable blood plasma disorder. By July 2005 he was receiving dialysis treatment for kidney failure. He had his lower right leg amputated as a result of complications from diabetes before dying of heart failure on 13 August 2005, aged 63. We have 29 biographies, 3 articles, related to Death of David Lange.